For an 'Interactive Map of Sumatra' click the link or the image. Different countries, different cuisines. Here it's dog, prepared in the backyard of a restaurant in Ambarita on Samosir Island/Lake Toba. The dog got killed with a knife, then put on a piece of corrugated sheet, got petrol poured over it and the fur burned off. The rest is roasted then and the meat presented to the restaurant guests. I have seen Batak People roasting a whole, complete pig over a fire without cutting it first or remove the entrails at least. Thomas Stamford Raffles, the founder of Singapore, was governor of Bengcoolen (Benkulu) from 1818 on. 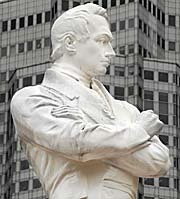 Image by Asienreisender, 2012, the Raffles statue at the supposed landing site in Singapore. 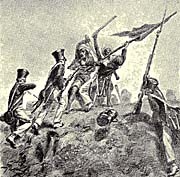 A scene from the Padri War (1803-38). The djihadist Padri invaded after a hajj to Mecca the Minangkabau People with the intention to force them under a stricter islamic rule. The Minangkabau called the Dutch for help. In a series of fights the Padris were fought back and the Dutch extended their grip on Sumatra. Image source: en.wikipedia.org, common free. The Aceh Wars (1873-1914) were certainly the biggest series of wars the Dutch fought on Sumatra. The Acehnese' resistance was strong and supported by the Ottoman empire (Turkey). Due to a series of tactical mistakes the Dutch ned a long time to fight the Acehnese down. 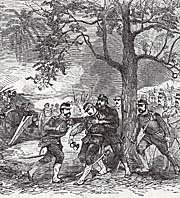 The scene on the picture shows the death of general Kohler in a battle. Image source: en.wikipedia.org, common free. 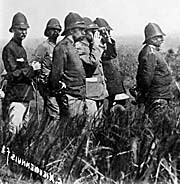 A Dutch general and his officers are watching a bombardement in the Aceh War. Image source: en.wikipedia.org, common free. Sumatra is a large island in the west of Indonesia. It's size is slightly smaller than that of England and Germany together (473,500km2, included are the smaller islands around). It's stretching over a length of almost 1,800km over a northwest to southeast direction. It's backbone is the Barisan Mountain Chain (Bukit Barisan), which is elevated by the Sunda Trench southwest of the island. 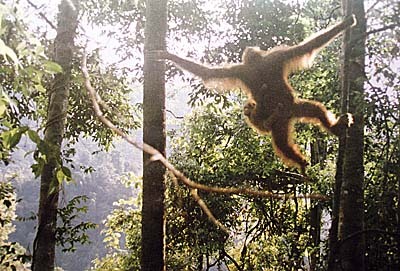 Sumatra is one of the regions with the highest biodiversity on earth. In it's natural state it was mostly covered with tropical rainforests, swamps and mangrove forests. Since the Barisan Mountain Chain is coined by mostly active volcanoes (it's part of the 'Indopacific Ring of Fire'), the volcanic outbreaks over ages produced a very fertile soil. Some of the mountain peaks extend 3,000m; Gunung Leuser in north Sumatra for example is 3,466m high, and the highest peak on Sumatra is that of Mount Kerinchi with 3,805m. One of the most spectacular landscapes in the world is the region around Lake Toba, which was formed by the outbreak of the supervolcano Toba, 75,000 years ago. According to anthropologists this gigantic outbreak caused a several years lasting climate change which brought homo sapiens almost to extinction. Because the Australian tectonic plate is moving towards Sumatra with a speed of 5.5cm per year at the Sunda Trench, there are frequently earthquakes and volcano eruptions in Sumatra. The Barisan Mountain Chain earns it's existence to this tectonic movement. However, it causes frequently smaller and larger disasters. The most known was the great tsunami on December 26th, 2004, which affected also parts of Malaysia's west coast and Thailand's coastline at the Andaman Sea. The 2004 tsunami killed estimated between 170,000 and 300,000 Indonesians, mostly in the northernmost province of Aceh. Earthquakes in the area around Padang cause frequently great destructions and demand human victims. Since 2010 Gunung Sinabung, a volcano close to Berastagi, has a series of outbreaks. 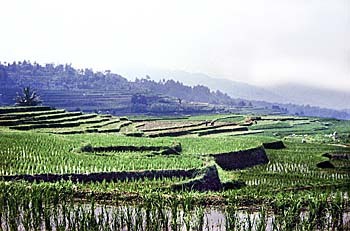 While the Barisan Mountain Chain stretches along the western parts of the island, the eastern parts are tropical lowlands. They were formed by silt sedimentation brought by the many rivers who flow down the eastern slopes of the Barisan Chain. The broadest parts of Sumatra measure some 370km. Modern industries have the easiest access to farmland in these plains. Plantation economy started in the 19th century, when the European colonialists, the British and Dutch, claimed the lands more and more as colonies. Sumatra is famous for the production of tobacco (almost any male Indonesian is a chain-smoker), coffee, and since the mid-1990, palmoil and rubber in large scale. 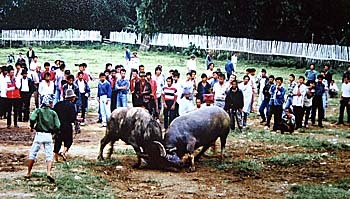 Fighting animals are always a pity sight. For the locals, though, it's a great event, and there is always money in. However, without force the water buffaloes wouldn't fight. 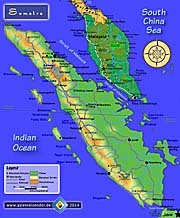 Geographically, Sumatra is separated from the Indochinese mainland by the Strait of Malacca. The closest neighbouring island is Java in the southeast. Both islands are divorced by the 40km wide Sunda Strait, in which the famous volcano Krakatau (816m) is situated. In the last ice-age (which ended roughly around 10,000 years ago), the sea level was much lower than now and Sumatra was connected with the mainland and partially with the other big Sunda Islands as Java, Borneo and Bali. Sumatra is part of 'Wallacea'. Because of Sumatra's island status, the lack of a developed infrastructure and the fact that Indonesia's visa politics are restrictive and buerocratic, it remains relatively isolated from mainland Southeast Asia. 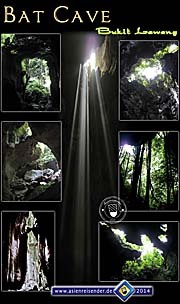 The remaining nature, particularly the tropical rainforests in the Barisan Mountains, are a fascinating terrain and travelling in Sumatra and digging deeper than the average tourist is somewhat really adventurous. Above: Minangkabau children around Bukittinggi. While hiking over the countryside at Padang Lawas, the villagers were very curious about the strange intruder. A couple of years ago a photo was still somewhat particular and a small sensation for the kids. These are digitalized slides. The image below shows village kids in one of the many, nameless villages inmiddle of rice paddies. The island's population has a rapid growth. In 1995 there were approximately 30,000,000 people living in Sumatra; until 2014 the population almost doubled up to some 54,000,000. It seems that the birthrate slowed somewhat down, but there is still a considerable growth - marriages, families, kids - that's all very important for the local people. 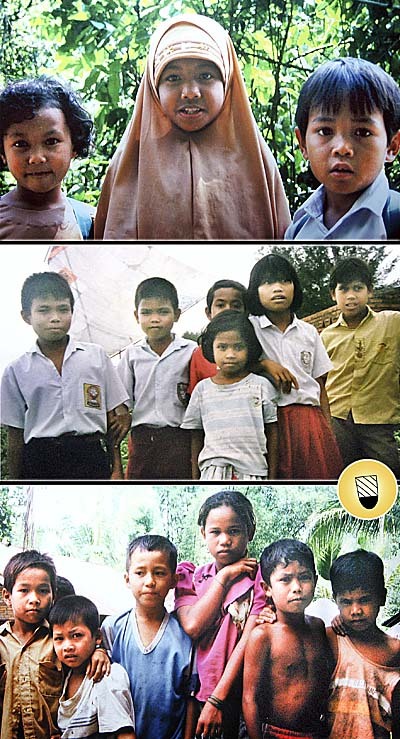 When I came first to Sumatra in 1995 I noticed that women around 30 years had often already eight children. They would, predictably, get some more. Most of the population is basically of Malay origin and evolved sophisticated local cultures over the centuries when living on Sumatra. Islam was first introduced in the 13th/14th century by Indian merchants and spread out over most parts of the island in the following centuries. Nowadays about 80% of the population are muslims. The urban centers are Medan, the biggest city with more than 4.5 million people, Palembang and Padang. Alltogether the population is split into a number of different ethnics respectively subethnics with very different cultures and 50 local languages. Some very remarkable tribes are the Batak People, who live in the mountainous area around Lake Toba in north Sumatra. 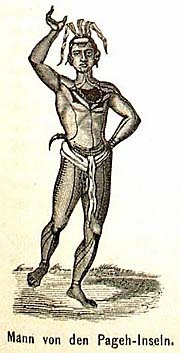 Many of the Batak became christians due to the missionary efforts of Ludwig Ingwer Nommensen from the Rhinesh Missionary Society and others who followed him. 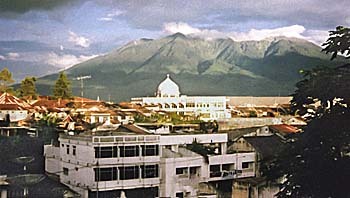 Aceh, the very north of Sumatra, is dominated by a muslim population and gained, after decades of civil war against the central government in Jakarta, a semiautonomous status. The political and religious class used their freedom to introduce the islamic sharia as legal system in 2003. The sharia is also widely forced on non-muslims in Aceh. The Acehnese are ethnically different from the other Indonesians and the Acehnese language is also significant different from the neighbouring peoples languages. This region is home for Indonesia's largest oil and gas reserves. A number of international oil companies have their branches in Aceh. There is also gold, copper and iron, but despite the natural riches of the land the vast majority of the people remains bitterly poor. The Royal Palace of the Minangkabau in west Sumatra. It's a big, sophisticated building made mostly of bamboo and rice straw. Accidentally the Minangkabau use since old times the same tricolore as the Germans do: black, red, yellow. 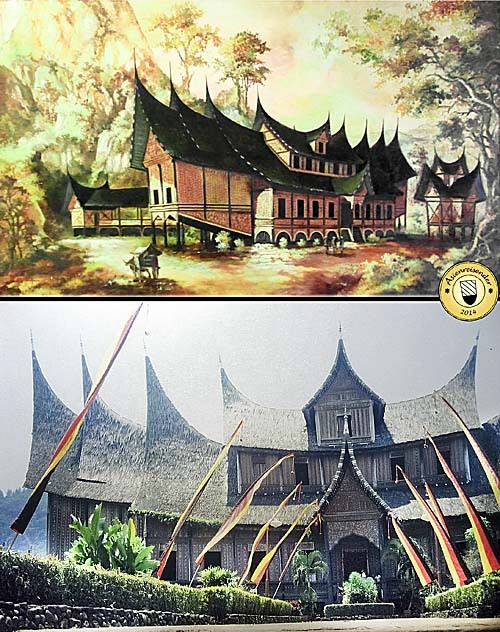 The picture above is a painting seen in a Minangkabau restaurant in Singapore, 2012. The small building at the right is a rice store. Another very intersting culture represent the Minangkabau in west Sumatra. This culture combines it's traditional matrilinear culture with islam. The Minangkabau have a very distinctive culture and customs. Also their architecture is unique and remarkable. A Minangkabau legend tells that the people came in the first centuries after Christ from India to west Sumatra. The first kingdom was established in the 14th century. The religion was buddhism, before islam spread out in the 15th and 16th century. Dutch merchants arrived around 1680, in the 17th century the British occupied the land. 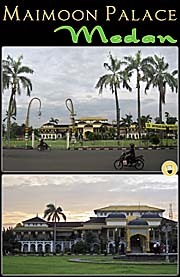 The capital of the contemporary province of Sumatera Barat is Padang, a famous town in the mountains is Bukittinggi. 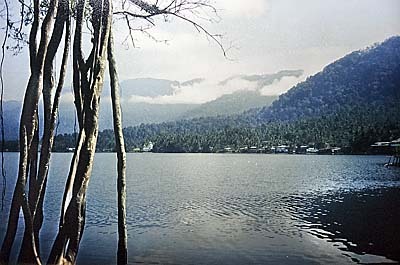 Lake Maninjau is a famous natural sight and the whole landscapes are very picturesque. The local economy is based traditionally on rice cultivation, coffee, tea, tobbacco and coconut production; nowadays rubber and palm oil play an important role. West of the Minangkabau territories in the Indian Ocean are the Mentawai Islands. South of Sumatera Berat (Province of West Sumatra) lies Bengkulu. It has a long time been British, since the British East-India-Company founded a trade post here in 1685. 1714 a fortress was erected, Fort Marlbourough, which still exists. After the years of governing over Java Sir Thomas Stamford Raffles became governor of Bengcoolen in 1818. West of Sumatra runs a large island chain, which is considered geographically part of the main island. In the very northwest of Sumatra the island chain continues further upwards as the Nicobar Islands in the Andaman Sea. Although the Nicobars are Indian territory, they are much further away from India than from Burma/Myanmar, which coast is closest to them. 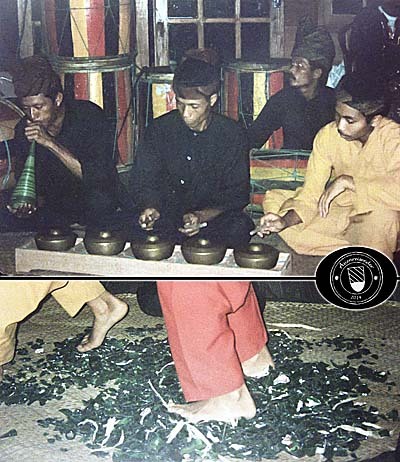 A Minangkabu Gamelan Orchestra is playing traditional music. It's accompanied by two male dancers, who promote a shard dance. To prove the shards are real they smashed the beer bottles in front of the audience's eyes. Many of these Sumatran islands have ancient, stone-age megalith cultures with large stone graves and other architectorial remains of very old times. One of the two touristic of these islands is Nias, a large volcano island with approximately 650,000 people living on it. 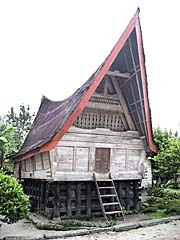 The indegenious Niassans have a linguistic relation to the Batak tribes in north Sumatra. 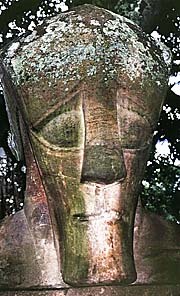 They were traditionally widely scared headhunters, practicing ancestry and animism. Europeans and Malays avoided the island for a long time. 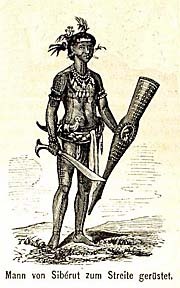 When the first European missionaries from France appeared on Nias in the mid 19th century, they failed and got poisoned. The next generation of missionaries who followed them in the footsteps of Ludwig Ingwer Nommensen was more successfull. 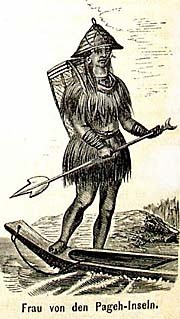 Particularly Heinrich Sundermann from Ladbergen/Muensterland, as well as Nommensen from the Rhinesh Missionary Society of Barmen, became a significant personality for the Niassans. As Nommensen did for the Batak, Sundermann translated the bible into the local language. It is the result of his and others who supported him there as well as from Germany and the Dutch colonial administration, that the People of Nias are nowadays by 80% protestant christians - and not muslims. Another destination for tourists is Siberut, another island south of Nias. It's also populated by a stone-age tribe and is a place for surfers. Siberut is one of the Mentawai Islands. On these islands live the most ancient people of Indonesia. Originally the whole island was covered mostly with tropical rainforests in the lowlands and partially the mountains, swamps and mangrove forests in the coastal regions, particularly the east coasts. 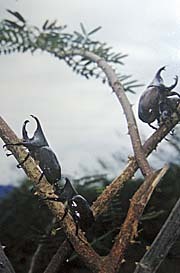 The higher altitudes of the Barisan Mountains were overgrown with Sumatran pine forests. These tropical pines are somewhat peculiar, and they were first described by the explorer Franz Wilhelm Junghuhn in the years 1840-42. Since it's crossed by the equator and receives monsoonal rains, in combination with the very fertile volcanic soil, the whole land is extraordinarily rich in biodiversity. Sumatra is home to a number of species who don't exist (anymore) else in the world. Most prominent is certainly the Sumatra Orangutan, there is the Sumatra Tiger, a tiger subspecies particularly living here, the Sumatra Elephant, the Sumatra Rhinoceros and the Sumatra Ground Cuckoo, just to name a few of them. Among the rare and partially unique species are also many plants. One very popular is the famous Rafflesia arnoldii. Meanwhile the huge island is loosing it's natural habitats in a rapid and increasing speed. Annual grand forest fires cause a lot of harm, together with regular and irregular logging - most of all for the sake of great oilpalm and rubber plantations. Logging started already in the 19th century, when the Dutch and other western farmers cut forest for the first tobbacco plantations. Due to modern technology and globalized automobilization the energy and recource hunger of the world is barely to feed. In the last 35 years alone, especially since the mid 1990s, Sumatra lost 35% of it's original rainforests. 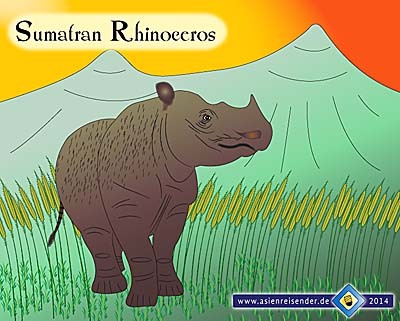 The earliest human traces on Sumatra date back 2,500 years. The first yet known Sumatran kingdom was that of Kantoli in the 5th century CE, which was followed by the empire of Srivijaya, which was of influence over larger parts of Southeast Asia. 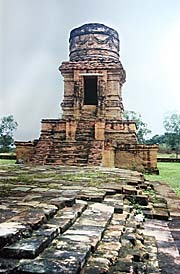 Candi Bahal I, at Padang Lawas Archaeological Site. 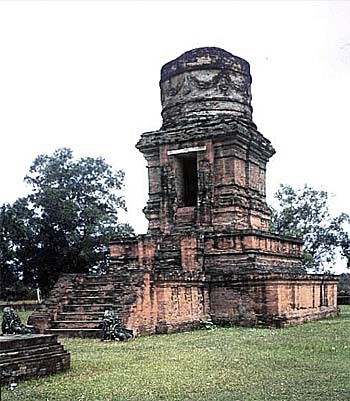 Candi Bahal is part of a medieval buddhist temple complex (11th century) in north/middle Sumatra, which was under the influence of the then mighty Srivijaya empire. It was said there was a ritual cannibalism practiced here in the old times. Srivijaya was a buddhist kingdom with it's center close to nowadays Palembang It was a maritime power which spread it's influence from island to island by trade and conquest. Srivijaya's capital at Palembang was also a center for scholarly learning. A Chinese buddhist pilgrim named I Ching studied here for several years Sanskrit, translated buddhist texts and wrote own contributions. 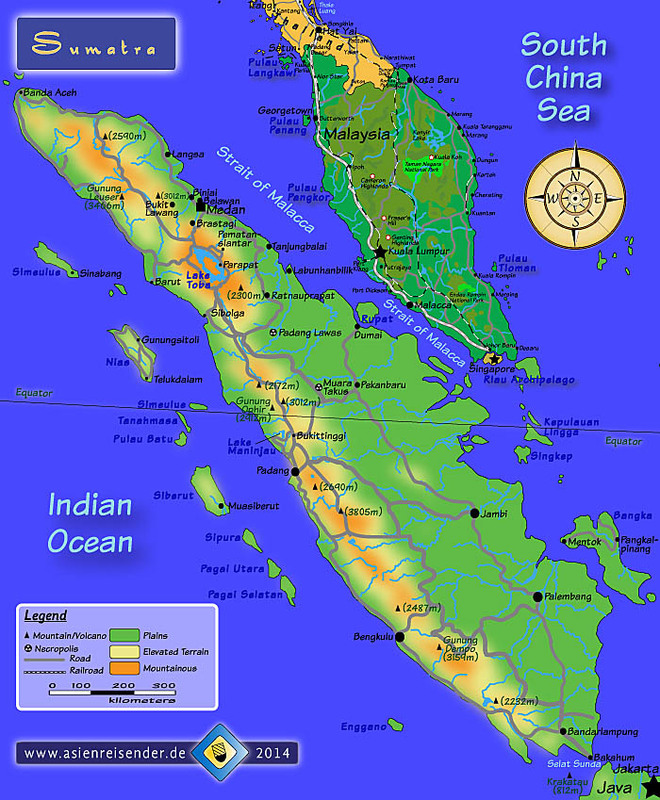 When Srivijaya's power declined in the 11th century, much of Sumatra came under the influence of the south Indian Chola empire. Also islam came to Sumatra via India. The famous western merchant Marco Polo visited Sumatra on his way back from China in 1292 CE. In 1511 Malacca on the Malay Peninsula fell into the hands of the Portuguese, and from then on more and more Westerners came to Sumatra. Most successful were the British and Dutch, who founded trade posts and extended their influence. In the Dutch-English Treaty of 1824 the whole of what is now Indonesia fell to the Dutch, so also Sumatra. The Dutch altoghether ned centuries to successfully spread their power over the whole of the large island. They led several wars against local populations, namely the Padri Wars (also: Minangkabau Wars, 1803-38), the Batak Wars (1872-1907), and the Aceh Wars (1873-1914). The Dutch rule ended with the Second World War and was official with the Indonesian declaration of independence on August 17th, 1945. A map of Sumatra. For an enlarged, 'Interactive Map of Sumatra' click the link.